Heart's Delight Cards: It's a BEAUTIFUL Day! 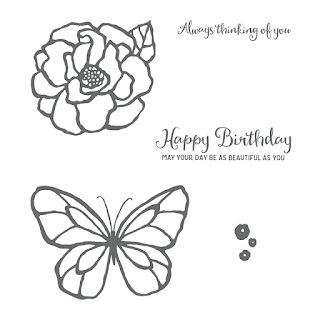 Oh, yes it is, because today is the start of the Occasions Catalog AND Sale-A-Bration! What is Sale-A-Bration? Only the biggest event that Stampin' Up! has every year, where you get freebies, based on how much you order (in $50 increments)! And why else is today a Beautiful Day? 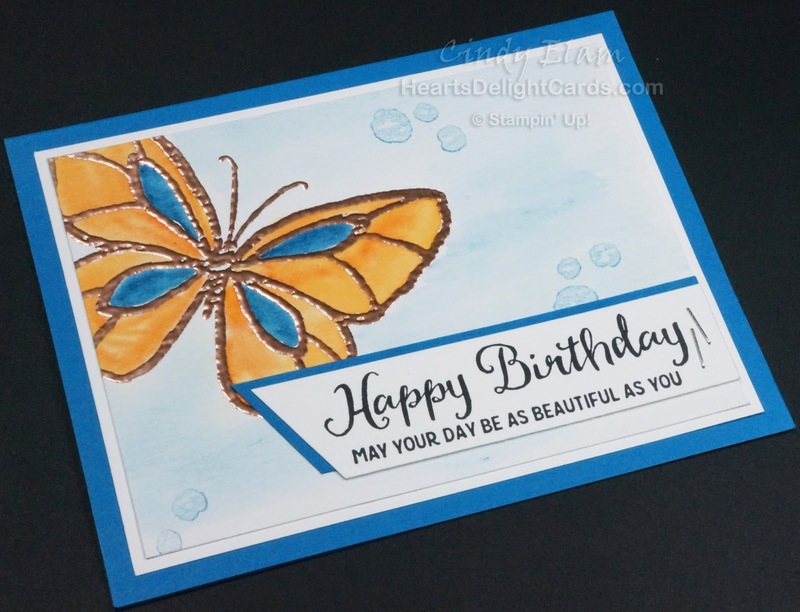 Because that's the name of the stamp set I'm using here! It's an absolutely lovely set, and perfect to use with the new Brusho Crystal Colours! It's avalable in either wood mount or clear mount, too. 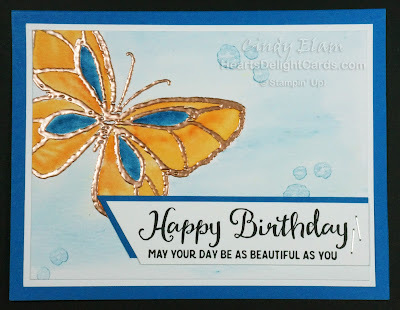 After I heat embossed the butterfly with copper embossing powder, I used an Aqua Painter and colored the wings with the Prussian Blue and Gamboge (orange) colors, drying each color with the heat tool before adding the next color to prevent bleeding colors. 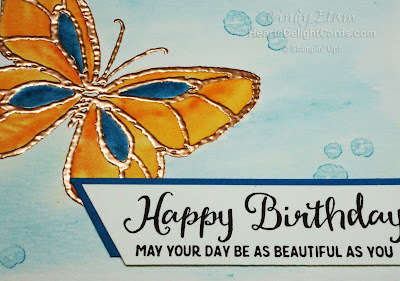 When the butterfly was completely dry, I added a light washed background, and stamped the spots with Marina Mist (stamped off twice). I love how the butterfly almost looks like stained glass, don't you? If you want to see the new catalog and SAB brochure online, just click the images on the left side bar. If you'd like a copy sent to you, please contact me, and I'd be happy to mail them!